Chewing gum can cause a sticky mess that's difficult to remove. Scraping used gum off furniture or trying to get it out of clothes or hair can be a challenge. Stuck chewing gum doesn't have to be the end of your items. There are some tried and true methods that can help to remove a sticky gum mess while minimizing damage. 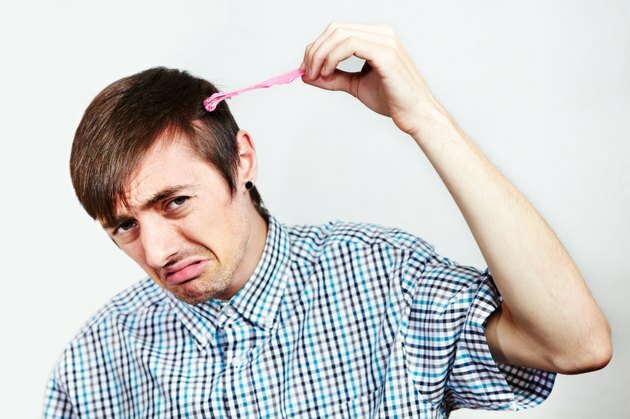 Peanut butter is a popular method for removing gum from hair or furry items. The oils in peanut butter stiffen the gum, helping it to loosen from fibers and follicles. Spread creamy peanut butter through the gummy area and work it in until the gum starts to pull away. Be gentle in your pulling, as not to cause damage or pain. When there's no more gum, shampoo as usual to wash away leftover oils and residue. Ice is an important tool in the gum removal arsenal. Ice freezes gum so it hardens and cracks, making it easy to scrape off a surface. To use the ice method, hold an ice cube or freeze pack on the gum for 15 to 20 minutes until it hardens. Use a blunt knife or scraper to remove the gum from the surface. Be gentle to avoid damaging the item. If the gum leaves a stain on clothing, spray with a laundry pretreatment spray and let sit for at least an hour before laundering as usual. Hairspray works the same with gum as it does hair. The alcohol in the spray will cause the gum's stringy fibers to become stiff, making it easier to scrape it off a surface. Apply the hairspray directly on the gum and let harden. Once hard, scrape off with a blunt item to remove. There are several other common household products that can help to remove gum from different surfaces. Cooking oils and rubbing alcohol work in the same manner as peanut butter and harden the fibers in the chewing gum. Avoid using oils to remove gum from clothing as it can cause stains. Duct tape is effective in pulling hard gum from tables, walls and other surfaces. (Just don't use it on hair. Ouch!) Also, household wonder product WD-40 can lubricate gum so it loosens from hard surfaces like floors, walls and tables. Like cooking oil, it can cause stains so avoid using it on fabrics. Avoid using heat to remove gum. While it does make the gum soft, it also causes gum to remain sticky making it difficult to remove. If not applied properly, the heat can cause the stickiness to spread.